Move that truck! When a truck gets stuck under a bridge, it causes a terrible traffic jam that soon turns into a block party. When attempts to remove the truck fail, two kids, some balloons, and a dog save the day. Sparse text, energetic rhyme, and clever illustrations bring depth to this simple tale. Oh, no! The viaduct is too low. The big red truck gets stuck, and in no time there’s a sticky traffic jam, with rubbernecking and horns honking and a virtual parade of colorful vehicles (followed a bit later by an actual parade of Boy Scouts carrying balloons). A comedy of errors ensues until a handful of helmeted traffic cops supervise the freeing of the big red truck. Wolf’s rhyming text is simple but snappy, and minimal enough to be mastered by very young readers or even younger listeners. And Davies’s quirky pen-and-ink illustrations should yield abundant laughter. Each vehicle (neatly identified) is a story in itself, from the long pink limousine to the exterminator’s truck with the bobbing bee on top to the leaky cement mixer. A delirious age-appropriate romp. Sometimes an accident spells good luck. For the unnamed boy and girl running a lemonade stand in front of their house, a truck stuck under a nearby overpass is just such an event. Part rhyming book for new readers (though the word viaduct on the second page might be a struggle) and part humorous drama as the traffic jam builds and builds, this appealing story highlights the entrepreneurial spirit of the young protagonists. They go where the business is, whether it is delivering lemonade to the traffic cops or encouraging a stranded clown to attract customers with his balloons concession. Eventually, thanks to the girl’s ingenuity, the truck is unstuck and the children celebrate with their new friends. 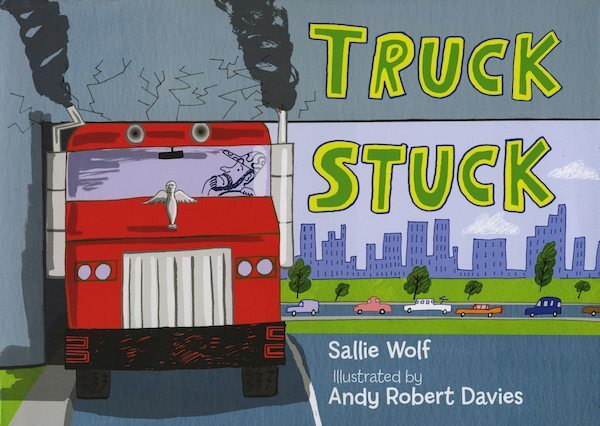 Clipped sentences, all rhymes and phrases, tell this story of cars and trucks and things that won’t go. “Let us through-we’re stuck, too! Jobs to do. Recycling truck, excavator, limousine, exterminator. All stuck. Move that truck!” Stylized cartoon illustrations add to the humor. Skin tones are either ghostly white or dark brown, much the way children draw when faced with a small box of crayons. A stretch limo languishes behind an exterminator truck sporting a giant dead bee, and an Elvis lookalike sits behind the wheel of a pink convertible. Kids who are crazy about vehicles will love this one: it’s easy to read and a whole lot of fun. Good luck, big truck!